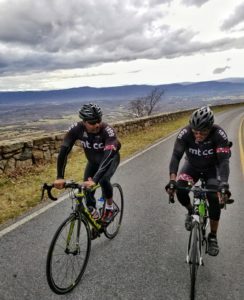 Start your cycling season right with the Philadelphia Major Taylor Spring Training Series. The goal is to get in shape for the season. Each week the rides will increase in distance and add more climbs. During the ride, ride leaders will provide training advice. Every weekend there will be a stretch ride that will go further and harder than the week before. The first rides will be at a C+ pace then move to a B pace. No one dropped. We will regroup as needed especially at the top of climbs. During the week you are expected to participate in shorter rides or strength training that will improve your climbing. We will discuss suitable mid week training during the ride. In March, Spring training will include Hill Repeat Wednesdays. Rest your legs at least 1 day prior to the ride to ensure your legs are rested.